Combining the best elements of my two favourite sweet treats, flapjack and Bakewell tart, this recipe is one I make on regular basis. 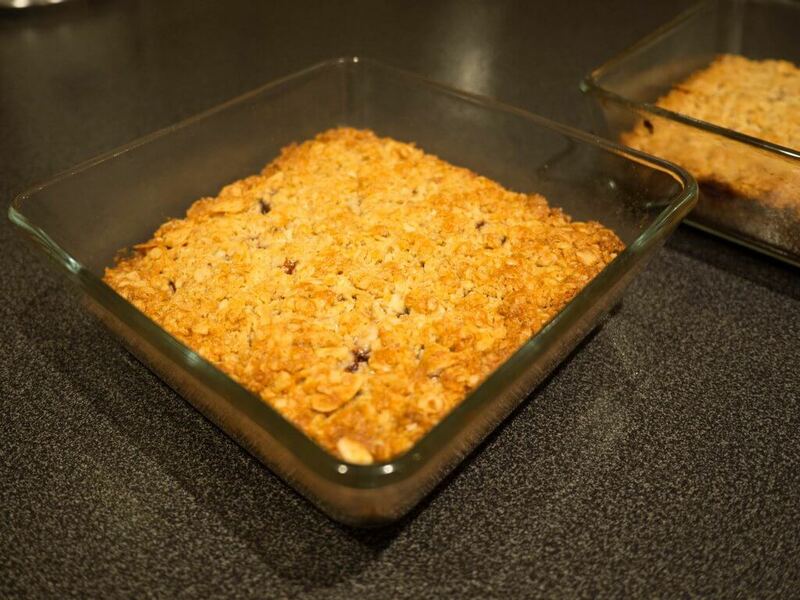 Flapjack is ideal for taking on hikes as a snack and this variation elevates it to a new level! Credit to LaurenJC, whose recipe I’ve based mine on with just a few tweaks. 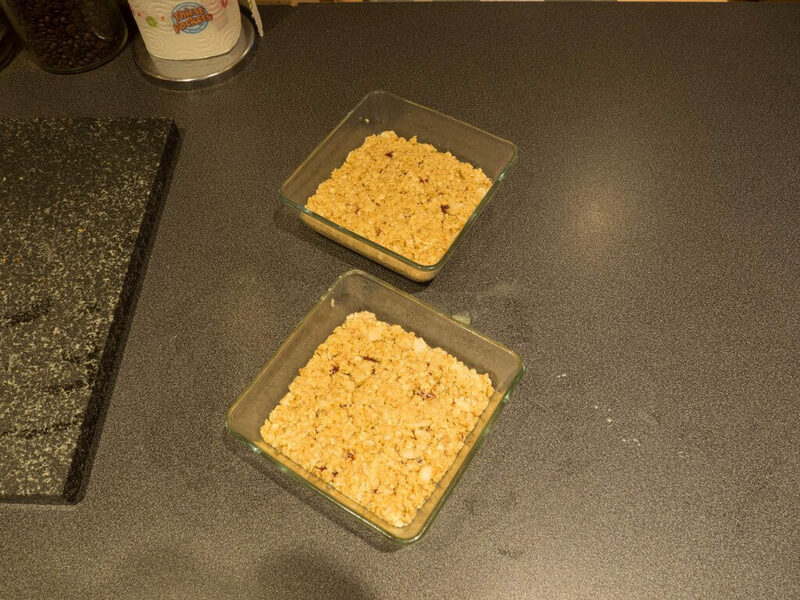 The quantities below make plenty enough for two 15x15cm portions if you like your flapjack nice and chunky. 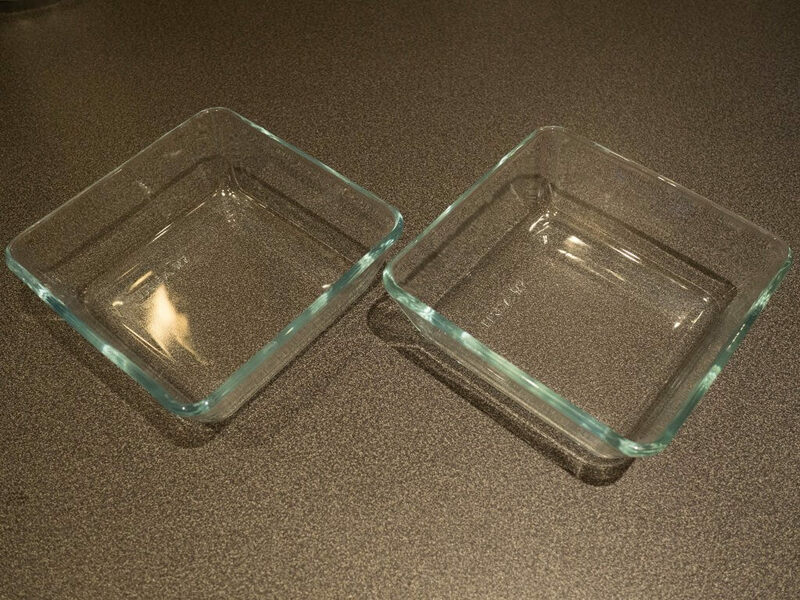 I use two of these IKEA MIXTUR glass oven dishes which are ideal. 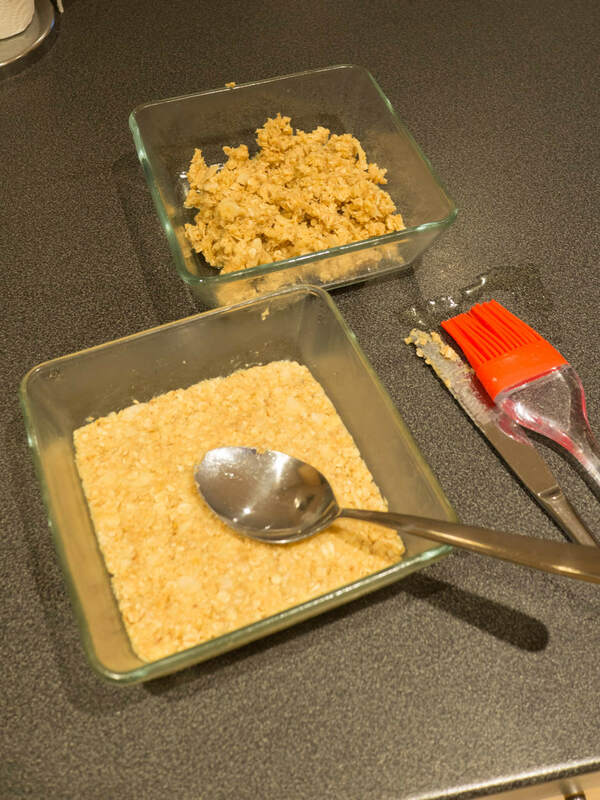 I prefer to use two smaller dishes over a single large one to minimise the problem of the flapjack over-cooking at the edges while under-cooking in the middle. Grab a large mixing bowl and take a note of it’s weight before you add anything to it. The relevance of this will become clear later! Mix all the dry ingredients into this bowl. Melt the butter. I prefer to do this in the dishes that the flapjack is going to end up in so that it effectively greases it at the same time. Two birds, one stone! 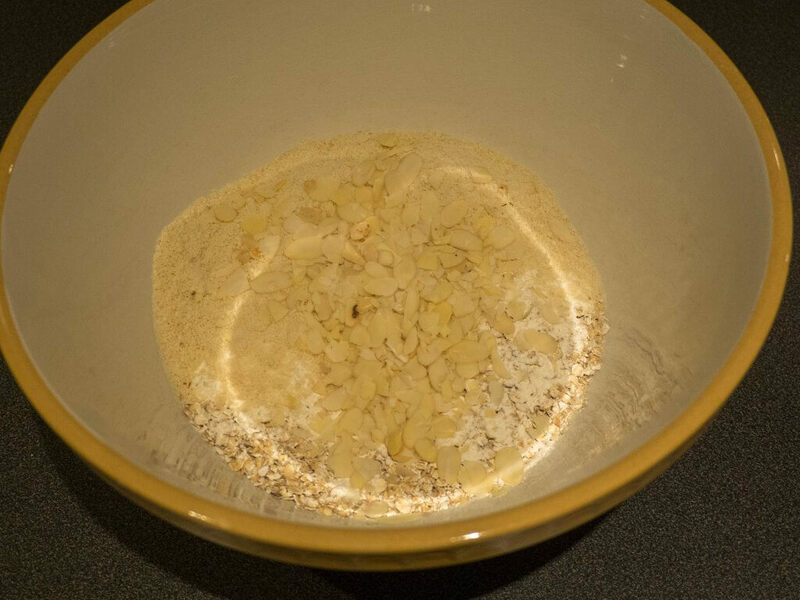 Add the melted butter, almond extract and golden syrup into the bowl with the dry ingredients and mix well. Make sure both dishes are greased well. Weigh the bowl complete with mix, deduct the original weight of the bowl that you noted in step 1 to give you the weight of your mix. All becomes clear now doesn’t it?! 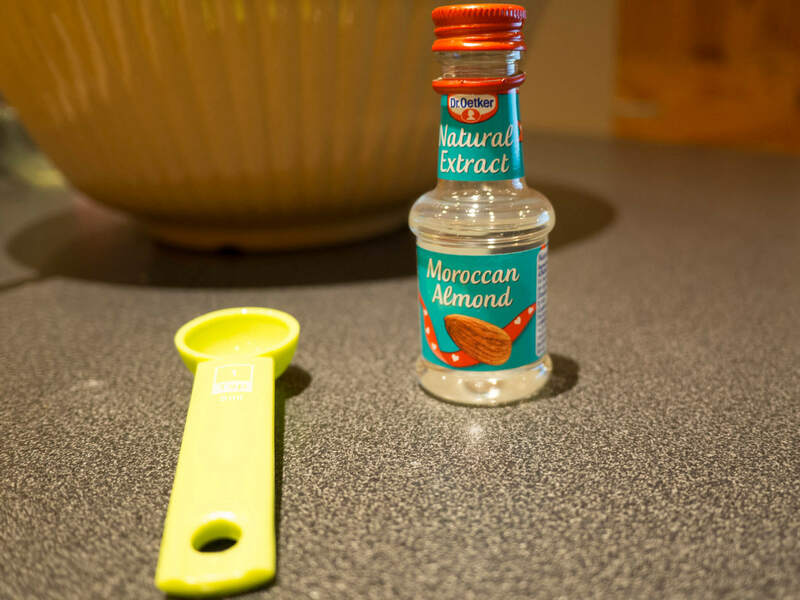 Take a quarter of the mixture (based on weight) and using a clean metal spoon, press it firmly into one of the greased dishes. Then do the same for the second dish. 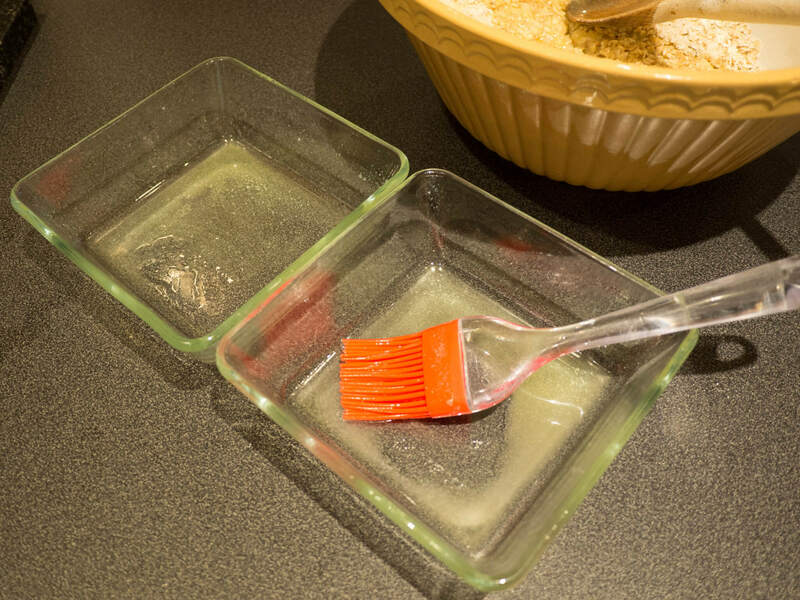 If you’re only using one oven dish, then of course use half the mixture for this foundation layer instead. Make sure the mix is nicely compacted and solid. I tend to smooth it over with the back of another clean dessert spoon. Spread the jam over the layer of flapjack, leaving about 5mm from each edge so the jam doesn’t seep out and stick against the side of the dish. Add another layer of the flapjack mix on top and try to press it down without forcing the jam out. Bake for around 20 minutes, possibly longer, in the centre of your oven. Keep a close eye on it and take it out once the edges have turned golden. It’s very easy to overdo it! There you have it! Leave them to cool before attempting remove from the dishes, otherwise they probably will disintegrate into bits. Yum! Seems I only use this blog for dumping recipes! Here’s a new one for banana bread chocolate chip muffins. This makes a nice alternative to a normal banana bread loaf. Line a standard 6 cup muffin tin with bun cases. In a medium bowl, whisk together flour and cinnamon. In a smaller bowl, whisk together banana, sugar, egg, butter and milk. Stir in chocolate chips/broken chocolate. Divide batter evenly between prepared bun cases. Bake until tops spring back when lightly touched, about 20 minutes. Cool in pans 5 minutes, then remove to wire rack to cool completely. Before BitTorrent, before eMule/eDonkey, the file sharing platform of choice was WinMX. It seems like a lifetime ago and in technology terms, it was. It required a lot more manual intervention in order to exchange files compared to modern software. It was very inefficient, slow and quite frankly a little ugly. However, one thing I did love about WinMX was the built in chat room facility which nurtured many a community, usually centred around whatever files were being shared. I got quite friendly with the bloke who ran one of the chat rooms and completely out of the blue he emailed me recently. It was great to hear from him and it took me right back to my days at University, he says as if I’m sat in my easy chair with slippers and a pipe, offering Werther’s Originals around to small children. My friend did have good reason for making contact, aside from to say “Hi”. You see, WinMX had an annoying bug where large files would occasionally become corrupt if the transfer was terminated before competition. Attempting to resume the file would sometimes give you a warning message and many people simply restarted the file from scratch. My connection at the time was 128kbps down and 64kbps up and the files I shared were mostly around the 700mb mark. So when corruption occurred, it could take hours just to get back to the same stage of competition and it could just as easily happen again. However, some smart people discovered that if you stripped back the corrupt “dead wood” from the end of the file then resumed transfer of the file, more often than not it worked. The easiest way to do this at the time was to use file splitting software, which was designed to split large files so they could fit on multiple floppy discs or CDs. It was an awkward process and often you would trim a file only to find it needed more trimming off. At the time I had just completed a course in MFC programming as part of my degree so I decided to write a very simple program to handle this task better. And lo, Corrupt File Trimmer was born. A tiny Windows app which allowed the user to select a file up to 2GB in size and trim a certain number of bytes from the end of it. I distributed it around on the chat room and asked people to pass it on to other WinMX users. Well apparently it became quite popular and continued to be requested long after I left the WinMX world. Indeed a quick google search reveals that someone took the initiative to write a replacement program which would handle files bigger than 2GB. Finding all of this out now brings a smile to my face. So the request my friend had was that I put the program on my website for everyone to download. Well, here it is! Here’s my quick and easy Cheese and Broccoli Bake Recipe which will probably feed two people, or one chunky monkey like myself. Update: After cooking this many times I’ve revised this recipe somewhat. Gone are the potatoes and the quantities are a little revised. It now easily caters for 2 hungry people and probably more like 3 with normal appetites! Prepare and steam the broccoli. Melt the butter on medium heat in a saucepan large enough to fit all the broccoli in there later. Add the flour, mix well and keep stirring until bubbly. Gradually add the milk stir until well mixed. Bring to a boil and season with a bit of salt and pepper if you fancy. I never add salt when cooking but that’s just me. Turn off heat and get to work beating those eggs. Now gradually add the cheese. I usually save some back to put on last for a nice cheese top layer. Finally combine it together with the broccoli and whatever other veg you decided to sneak in there and mix it up good and proper. Slop it in a casserole dish, adding the cheese you saved back on top if you want, and bung in the oven at 325°F/165°C/gas mark 3 for about 30 to 40 minutes. Leave it to cool and dish it out. Sorted! Banana cake is very popular around these parts. Maybe it’s because it sounds healthy when actually it’s not. But anyway, here’s the recipe the little one uses. Perhaps I’ve just not been paying attention to new music in recent times but it seems there’s been a sudden influx of fantastic albums lately. Starting with The Delays “You See Colours” a couple of months ago, which came out of nowhere for me as I’d never even heard of the band. Pure catchy electro pop with a dusting of guitars. Sweet. Very interesting, unusual sound/production. Snow Patrol‘s fourth album “Eyes Open” hit bang on target, just as good as “Final Straw” if not an improvement. I wonder if Gary has had vocal coaching or maybe it’s just all that touring. In any case, his voice seems to have found new range and strength. I only noticed The Feeling when I saw there album was number 2 in the charts so it’s fair to say I’ve probably missed everyone raving about them. Looking them up on Wikipedia I notice Chris Moyles has been championing them and since I now only get his podcast perhaps I’m actually missing out on some good music! Never-the-less, anyone who’s not heard “Twelve Stops And Home” go and get it now. Gomez never dissapoint and it’s hard to believe that “How We Operate” is their sixth studio album. Seems like only a short while ago “Bring It On” was doing the rounds. Keane have certainly worked on their sound for “Under the Iron Sea”. A lot more work has gone in to the production and it’s a great follow up album, even if the songs themselves perhaps aren’t quite as strong. Finally, The Automatic – “Not Accepted Anywhere”. Worth checking out even though the backing singer doubling up the main vocal in a shouty stylee is a bit irritating for a whole album! Hayley asked me to install a web mail client on her domain a while back which might get past her work’s web filter (they don’t like you checking email at work). I came across RoundCube Webmail and got it installed in 5 minutes. Haven’t had time to really put it through it’s paces but the interface uses AJAX to good effect, much like GMail, but less cluttered. It certainly beats NeoMail, Squirrel Mail and Horder which were the pre-installed options bundled with cPanel and I would highly recommend anyone interested try it out, despite only reaching a 0.1 beta release it seems to handle basic functions faultlessly. Soulwax, where did the suits and humour go? I did Music Tech at Uni and a lot all my class mates were really in to the very latest new music, raving about the latest bands I’d never even heard of. I kind of got that feeling of being an outsider if I didn’t have a band that no one else had heard of to champion over coffee and a dunked mars bar. Indeed, there’s probably just one band who I can lay claim to picking up on before everyone else jumped on the bandwagon and that band be Soulwax. I caught the last 20 seconds or so of their song “Too Many DJ’s” when tuning in to Steve Lamacq’s show one evening in 1999, when they released the EP the first time round over here. I frantically typed the name of the band in to this revolutionary piece of software we had back in the day called Napster and absolutely loved what I heard. So I managed to track down the EP, followed by just about everything else that was released over here and whatever I could import. Eventually went to go see them support Muse and was not disappointed despite having their set cut down to just 20 minutes due to a delay letting people in. Saw them again at Nottingham’s Rock City when they had their own tour later in the year and again was blown away.They put on a real show with beige suits, flashing fluorescent tube mic stands, some clever ad-lib’ing when ear pieces didn’t work, bit of crowd interaction and old school Casio synth guitars. Friggin’ ace! So then came the 2 Many DJ’s phenomenon, taking bootleg mash-ups to the mainstream with tremendous success. I was as much a fan of that stuff as Soulwax the band but if we’re talking about a live performance, two guys behind a set of decks just ain’t gonna get the same reaction from me. Fast forward a year or so to the next album Soulwax album, Any Minute Now, and I went with some friends to see them in Manchester at the same venue as before. Perhaps expectations were too high but I was a little disappointed. The music was fantastic, the crowd was manic, but they’d dropped a lot of that crazy Belgium stuff which made the Much Against Everyone’s Advice gigs so great. No C-A-S-I-O in this set and very little in the way of crowd interaction. Caught them again at a much smaller venue in Nottingham the following year and they were much better but still there was no sign of ‘old Soulwax’ which I dearly missed. Then when me, Mark and Adi went to Rock Werchter I was hopeful that playing on home turf they might pull something out of the bag. Of course, they didn’t manage it, although I blame the crowd for being completely life less. In any case it seems the suits, mic stands and comedy are gone for good. Which is why when I stumbled upon this over lunch I came over all nostalgic (hey, 6 years is a long time for me). Enjoy. As many of you know, I have a reputation for doing things with laptop processors which really shouldn’t be done; modding them to run in desktops I mean! I’m still running my Mobile P4M 2.0GHz on 1.15v with a fanless Arctic Cooling AC-FRZ-4 Freezer 4 (yes, only the PSU fan quietly shuffling air around) and haven’t felt the need to jump to the next generation of processor, not that I could justify the outlay anyway. Having said that, I do like to keep an eye on what’s happening in the world of CPU’s just to see if there’s anything exciting on the horizon. Nowadays performance per watt is all the rage and AMD’s standard desktop line of processors does a pretty good job of running cool enough to run fanless while still kicking out great performance but what if you want to step up to dual core processing? You’ve got your work cut out for you trying to run the X2 fanless! Intel’s Core Duo finally brings Pentium M power characteristics to the desktop with the advantage of two cores and there are a few standard retail motherboards out there you can run one with. The exciting news is that AMD has just released details of their new Turion 64 X2 processor and it wouldn’t surprise me if this manages to keep AMD ahead of the game on both pricing and performance per watt. The only down side is that while existing Turions work in the majority of standard s754 desktop motherboards, which can be picked up very cheaply since they’re used for Semprons, the new Turions use a 638 pin socket S1 and I’m not sure if there are any plans to release desktop motherboards with this socket. Let’s hope they do because that may be enough to make me take the plunge on another upgrade!